Anyone who’s taken care of a shirt order for any size group knows that it’s a stressful job. You have to keep track of what everyone ordered, who’s paid, who hasn’t, then tally the entire order together. It can be a nightmare. We created O.T.I.S. to solve this problem. 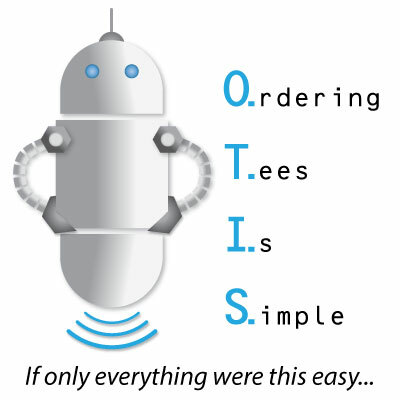 On any order, we can activate O.T.I.S., and give you a link that you can share with anyone where they can see what items are available and place their own order. Every person simply orders whatever they want, pays via credit card, and that’s it. We do the rest. We can even handle personalizations (names, numbers, etc.). The only hassle you have to worry about is handing out the shirts, which is easy because we give you a list of every person who ordered a shirt, and what they ordered. No problems. No surprises. Just easy. We can customize O.T.I.S. to meet your needs too. Looking for a fundraiser or just trying to earn a little extra money for your club or group by selling shirts? We can take care of that too. You can charge whatever you like for your shirts on the Order Form. We’ll cut you a check for the difference. You’d rather collect the money yourself? Sure. Want multiple colors to be available? No problem? You’ll also have access to an Overview page to see how your order is going. You can see how many shirts have been ordered, and who’s ordered them, so you won’t be in the dark. We also provide you with printable instructions, links, QR codes, and more. Handling a shirt order has never been easier.